BACK FOR GOLD: Defending champions Richard Allen, left, and Bruce Campbell, cycling in the colours of Cyclo Pro from Port Elizabeth, crossed the finish line first last Sunday at the fourth Fish River Mountain Bike Challenge. LAST weekend’s Fish River Mountain Bike Challenge was another huge success, attracting almost triple the entries it did last year. The event, which had slightly changed its course in its fourth year, was a two-day event over a distance of 110km. The challenge attracted extreme mountain bikers from all over the Eastern Cape and far corners of South Africa, with some entrants travelling from as far afield as Bela-Bela in Limpopo and Pretoria. 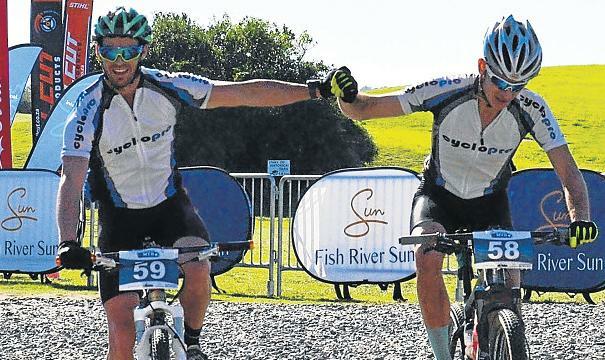 The weekend had an air of festivity about it, with Fish River Sun crawling with mountain bikers and their families, who stayed at the resort to support the participants. The race attracted male and female riders from various age groups, who competed either as individual competitors, team riders or in mixed teams. There was also a fun bike challenge event for children on the Saturday afternoon on the Fish River Sun resort grounds and an Amazing Race event for families. Fish River Sun operations manager Jabu Maseko said the mountain bike challenge had been a great event. “This is where people who don’t know each other meet and become friends. “The fact that the event has grown so much shows we are doing something good here – it really was a great weekend,” he added. Stage one of the race took the form of a 50km course on the western banks of the Fish River in and around the Kap River Nature Reserve. Riders had the opportunity to ride alongside an abundance of wildlife through a beautiful kloof. Defending champions Richard Allen and Bruce Campbell, from team Cyclo Pro in Port Elizabeth, finished the first stage in first position in an impressive time of 2:04. Newcomers to the event Willie Jansen van Rensburg and partner Harry Abourizk were placed second, 11 minutes after the first team came in. Stage two of the race took place on the eastern bank of the Fish River, taking riders over a tough 60km with some scenic gravel roads, jeep track, excellent single track and a few unavoidable cattle paths. The end of the leg takes riders through a unique loop through the Fish River Sun golf course, crossing the bridge over Old Woman’s River and finishing on the top of the hill in front of the Wahoo Restaurant. In the end competition favourites Campbell and Allen finished in a time of 2:45; five minutes faster than last year. Late morning excitement grew as the little ones gathered next to the finishing line cheering their moms and dads back home. “It still is a tough race but it was better than last year; they have trained the cattle to make a beautiful single track,” Campbell said. Gary Davies from Jeffreys Bay arrived soon afterwards and paddled in over the finishing line as the first individual rider in the open male category. Short on his heels was secondfastest rider in the open men’s, Dylan Petzer. Janse Van Rensburg and Abourizk came in second and were greeted by an entourage of happy supporters in an excellent time of 2:57. Husband and wife team Liezel and Ken Prentis were elated as they finished in second place and rode over the finish line in a happy embrace with a good time of 5:23. Taking part with his wife and son, Katrien and Peter, Camryn Middleton sat on the lawn cooling off with a cold beer. As a first-time rider to the challenge, Middleton had a good time. “It was really good, lots of great single track too. Although I didn’t see much wildlife, I did have a funny experience with two cows. They started to chase me slowly and steer me off the track and onto a different cattle track for a while before I realised. It did help to ride faster,” he joked with relief. Inside the restaurant, families enjoyed the champagne breakfast for Father’s Day and a fun and action-packed backdrop with jumping castles, kids’ entertainment and good old extreme sport. Fish River Sun’s own rising mountain bike star, Siyabonga Ntando, bettered his time in his second race by 15 minutes after falling in love with the sport three years ago. He was once again greeted with lots of support from the resort and his fans.